How often have you received advice that turned out to be terrible? Of course, there are those treasured nuggets of genius that helped us all on down the road of life and forever made a positive impact. So, in keeping with the yin and yang of life, a handful of Major League Fishing pros shared some of the best and worst advice they’ve received in the fishing biz. Good question. Probably just fish your strengths and do what you know. An old writer for Tulsa World covered me and told me to “dance with the one who brung ya.” It was good advice. Went with flipping and pitching, a flipping rod, 25-pound line, and a jig. It catches big fish. I went with it. More difficult lately to win with it, but it’s a lot of fun. Listen to dock talk to pick up on local knowledge. Terrible advice. Do what you know. My best fishing advice actually came from Clark Wendlandt. I was fishing as a FLW co-angler and was in the boat with him. I asked him about sponsors. Clark told me to “get that out of your mind and concentrate on catching them.” Great advice. It was Roland Martin encouraging me to go turkey hunting in the spring. It was terrible advice because that’s all I want to do. It probably hurt my spring fishing a bit. It’s a fun one, but serious, too. Oh gosh, you’re putting me on the spot. There’s no replacement for time on the water. 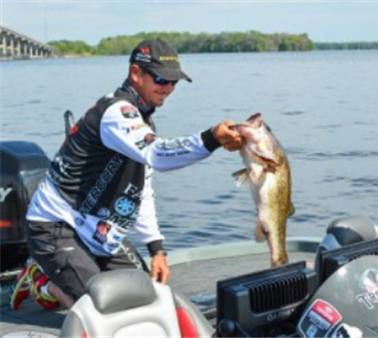 The good, bad, and ugly times on the water make you a better angler. “Bananas are bad luck.” Bananas are healthy for you. A good snack and good to eat. Bananas in the boat are not bad luck. Back in high school, I met Rick Clunn at Bass Pro in Springfield, Missouri. He told me to find your own fish and to find and develop your own skill set. When you get help to find fish, those fish generally have been exploited and educated. But when you don’t know any better, you may explore a creek the locals have written off and it turns out to be terrific. That’s how you win. “It’s not over until it’s over.” You can be down in a tournament, but as long as there is a chance, you’re still in it. You have to believe that. You can see the body language in some anglers when they’ve given up. I do that sometimes, but it really isn’t over until it’s over. When anglers want to make the fishing side of our sport into a science. There are no rules the fish follow as far as where they are and what they’ll hit. There are some basic ideas that are good starting points, but there are no rules. It’s not a science. Never take advice from an angler you’re fishing against. In over 28 years of competition, maybe one gave me worthwhile information. Other good advice is to do it on your own. Having a mentor show you the basics of fishing is good, but figuring out who you are as an aspiring angler is very important. I was starting to do well as a local tournament angler and I had the opportunity to fish with an established local pro. We were out on the water and I asked him “how do I get started as a professional?” He told me not to do it. It’s too hard and too expensive. I’m so glad I ignored that bit of advice and pursued my dreams. That bad advice motivated me to succeed.